The conquest of space was one of the main human achievements of the 20th century. In 1957, the first satellite named "Sputnik 1" has been placed into orbit. Four years later, Yuri Gagarin has performed the first human space flight on "Vostok 1" ship. 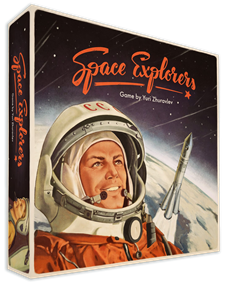 This game is dedicated to the first space explorers — i.e. all the outstanding people who have made spacefaring possible! Each player becomes the Head of a Research & Development Hub in the Space Research Center. You recruit best Specialists to your team and produce large-scale space projects — from placing satellites and manned spaceships into orbit to launching automated interplanetary stations! The game ends when the players complete all the available Projects or when one of the players recruits 12 Specialists to his/her Hub. The Specialists and Projects bring you Progress points. The player with the highest amount of Progress points wins. Support the game's physical release on the currently ongoing Kickstarter!